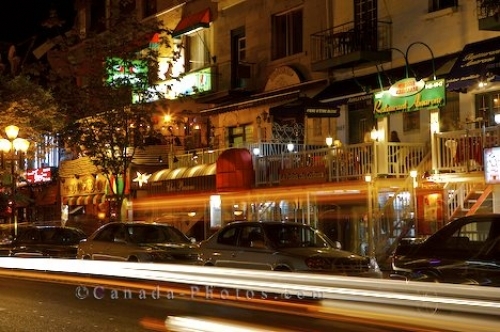 At some of the dining establishments along the Rue Saint Denis in Montreal, Quebec, people can enjoy their meal on the balcony which overlooks the street and the busy life of the summer months. Cars line the street below the balconies which makes parking spots far and few between as headlights pass by looking for the next available place to park. Photo of the Montreal, Quebec way of life along a street where you can view the action from the balcony above.